"You will be missed by all here at LCCA. You have touched so many lives while you"
Gladys (Novicki) Herrick, 92, died peacefully Saturday August 25, 2018 at the LifeCare Center of Acton, MA. She was the wife of the late Ralph W. Herrick, Jr., to whom she was married for 51 years at the time of his passing in 1998. Born at home in Maynard, MA she was the daughter of the late John and Rose (Leuka) Novicki and was predeceased by her sisters, Josephine Torppa, Stella Zaleska and Helen Baccaro. She is survived by four children, Linda Sperandio, Pamela J. Pino and husband Kenneth J., David Herrick and wife Laurie, and Marlene Thomas and husband Joseph; 5 grandchildren, Melanie Wetherbee, Robyn and Colin Sperandio, and Brittany and Brandon Herrick; and nieces, nephews, in-laws and their families. She was the mother-in-law of the late James Sperandio who died this past May. Mrs. Herrick grew up in Maynard and following her marriage moved to Acton for a time. The Herricks then built their home in Maynard where they lived for over 50 years. 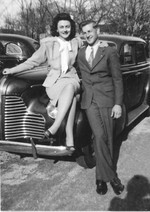 Together they enjoyed traveling, especially time spent on Cape Cod and in Florida. Mrs. Herrick enjoyed the beach and drawing. She especially loved children and the many pets her family cared for through the years. She will be deeply missed by all. In lieu of flowers, those who wish may make memorial gifts to benefit lung cancer research at the Dana Farber Cancer Institute. You may copy and paste the following link to give online: https://www.kintera.org/site/c.8eIIJWPvG7IQF/b.9127925/k.8B74/Make_a_Gift/apps/ka/sd/donorcustom.asp Please be sure to designate the donation in memory of Mrs. Gladys Herrick, and designate the gift for "Other" - Lung Cancer Research. You may also download the mail-in form from this memorial page. On the left of this page select the tab "Memories." From the drop-down menu select "Memorial Program" which brings up a new page. We have substituted the mail-in form for a memorial program. Click on the link and the form will appear for you to print and mail. You are also welcome to call the funeral home at 978-263-5333, and we will gladly mail or email a copy of the donation form. Thank you.